AAS-A Central Valley Chapter has recently taken the initiative to revive the music of the legendary Assyrian musician Sooren Alexander with new arrangements. It is expected that five of Sooren's music pieces to be performed at AAS-A Board of Directors annual meeting fund raiser in Modesto in February (details to follow). AAS-A CVC team has commissioned William Jeong a jazz musician from New York to take on this task. In description of this work William says, "I am trying to rearrange the music with jazz feel. Keeping all the original melody and making a little bit of re-harmonization on the chords. Because throughout the music the chords are very simple, I am trying to make more movements, also adding improvisation sections". We will post more information later. 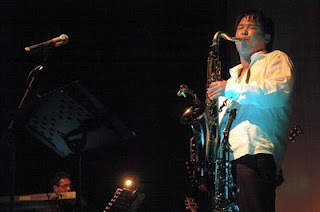 William (Ji Hoon) Jeong has degrees from Unitec University - Bachelor of Automotive Engineering and New Zealand School of Music-Bachelor/Master of Music in Jazz Saxophone. He was the leader, saxophonist and founder of “History of Jazz”. He also formed a worship group called "Sing for God" and toured in Oceania region. He is also involved in a lot of commercial and short film music as an arranger and a composer. Currently he is based in New York.